Lorenzo de' Medici, the brilliant, learned, and ruthless head of a wealthy banking family, ruled the Italian city-state of Florence in the Renaissance. This bust may copy a wax statue made to commemorate Lorenzo's survival in 1478, when an assassination plot took the life of his younger brother. The simple costume, with a distinctively Florentine padded and draped headdress, reflects Lorenzo's claim to be merely a respected citizen rather than a de facto prince. Cleaning in recent years (completed 2006) has brought out the original bright reds, warm flesh tones, and a light beard. The brooding face suggests the forceful intelligence behind Lorenzo's power. This haunting likeness may have been molded from his death mask. Alessandro Rivani [1746-c. 1832], Florence. Carlo Ernesto Liverati [1805-1844], Florence, until c. 1835; Rev. John Sanford [1777-1855], Florence and London; sold c. 1841 to Edward Nicholls Dennys, London, until at least 1850. Henry Labouchere, 1st baron Taunton [1798-1869], Stoke Park, Over-Stowey, Somersetshire, by 1862; by inheritance to his son-in-law, Edward James Stanley [1826-1907], Quantock Lodge, Bridgewater, Somersetshire; by inheritance to his son, Edward Arthur Vesey Stanley [1879-1941], Quantock Lodge; (his sale, Sotheby's, London, 16 July 1920, no. 17); probably purchased by (Duveen Brothers, Inc., London, New York, and Paris); sold to Clarence H. Mackay [1874-1938], Roslyn, New York, by 1923; his estate; sold 1940 through (Jacques Seligmann and Co., New York) to (Duveen Brothers, Inc., London, New York, and Paris); purchased 1941 by the Samuel H. Kress Foundation, New York; gift 1943 to NGA. Edward Nicholls Dennys (in a letter to the editor, "The Bust of Lorenzo the Magnificent," The Art-Union [October 1843]: 202) quotes a letter he received from the Rev. John Sanford (see note 2), from whom he (Dennys) purchased the bust: "It was previously in the possession of the 'Avvocati Rivani, a very distinguished scholar and collector of works of Art, who died about ten years since. He was Secretary to the Antiquarian Society called Colombaria." Rivani also owned Lorenzo de' Medici's death mask, which he gave to the Società Colombaria in 1827. See in addition Adrienne DeAngelis, "On the Ashmolean bust of Lorenzo de' Medici," The Sculpture Journal 13 (2005): 5-17, who also refers to Dennys' letter. In the same letter quoted by Dennys (see note 1), Sanford tells Dennys that he (Sanford) "purchased it of an artist, in whose studio he found it for sale as the undoubted work of Michael Angelo [sic]." Giancarlo Gentilini, in a letter of 12 August 1995 to Alison Luchs, confirms the artist as Liverati (information in the archives of the Accademia di Belle Arti di Firenze, 1852, no. 135; letter in NGA curatorial files). Sanford lived in Florence from 1815 to 1837, and formed a collection of Italian paintings. The 1852 document (see note 2) records that Sanford commissioned Aristodemo Costoli to make a cast of the bust and to carve a marble version. Molds were taken from the marble, and casts made, several of which Sanford gave to Italian institutions. Sanford took the bust to England, and offered it for sale, according to Dennys (see note 1), around 1841 "in the gallery of a commission-agent in Old Bond-street." The bust did not appear in Sanford's two sales, mostly of paintings, held in London in 1838 and 1839. See note 1. Dennys lent the bust to an exhibition at the House of the Society of Arts in London in 1850. Lord Taunton lent the bust to an extended exhibition from 1862 to 1864 at the South Kensington Museum in London. According to Trifon Trapesnikoff (Die Porträtdarstellungen der Mediceer des XV Jahrhunderts, Strassburg, 1909: 50), the bust was with "Lord Taunton in England." The 1920 sale catalogue incorrectly states that the bust was bought in Italy during the 1840s by Lord Taunton from Professor Santarelli, a well-known Florentine sculptor. The bust purchased from Santarelli is another bust of Lorenzo de' Medici now in the Ashmolean Museum in Oxford. Ulrich Middeldorf (Sculptures from the Samuel H. Kress Collection: European Schools XIV-XIX Century, London, 1976: 43-45) repeats this error, and mistakenly says the sale was held by Christie's instead of Sotheby's. Wilhelm Bode wrote to Joseph Duveen on 25 June 1920, expressing his opinion about the bust (transcription of letter in NGA curatorial files), and Mary Berenson wrote to her husband, Bernard Berenson, on 17 July 1920, describing Duveen showing her the bust (Barbara Strachey and Jayne Samuels, eds., Mary Berenson. A Self-Portrait from her Letters & Diaries, New York and London, 1983: 233). Wilhelm Bode, Art in America (December 1923): 5. See the Mackay files in the Seligmann papers, Archives of American Art, boxes 238-239 (copies in NGA curatorial files). The sale to Duveen was announced in The Art Digest ("Il Magnifico," [15 May 1940]: 8). Works of Ancient and Mediaeval Art, The House of the Society of Arts, London, 1850, no. 617, as Attributed to Michelangelo. Special Exhibition of Works of Art of the Mediaeval, Renaissance, and more recent periods, South Kensington Museum, London, 1862-1864, no. 1, as Florentine 15th Century. Recent Additions to the Kress Collection, National Gallery of Art, Washington, D.C., 1946, no. A-146. Verrocchio's David Restored: A Renaissance Bronze from the National Museum of the Bargello, Florence, National Museum of the Bargello, Florence; High Museum of Art, Atlanta; National Gallery of Art, Washington, D.C., 2004, not in catalogue (shown only in Washington). Florenz!, Kunst- und Ausstellungshalle der Bundesrepublik Deutschland, Bonn, 2013-2014, no. 109, repro. Nello splendore mediceo: Papa Leone X e Firenze, Museo delle Cappelle Mediceee, Florence, 2013, no. 8, repro. Trapesnikoff, Trifon. Die Porträtdarstellungen der Mediceer des XV Jahrhunderts. Strassburg, 1909: 49-50, repro. Sherman, Frederic F. "Italian Portrait Paintings and Busts of the Quattrocento." Art in America 12, n. 1 (December 1923): 5, repro. Valentiner, Wilhelm R. "The Clarence H. Mackay Collection." Art in America 13, no. 5 (1925): 250-251, fig.7. Valentiner, W.R. The Clarence H. Mackay Collection. New York, 1926: 6, 9-10, no. 14, repro. Westheim, Paul, ed. "Achtung, Falschkunst! Fälscher und Kenner." Das Kunstblatt 14 (July 1930): 204, repro. Warburg, Aby. Die Erneuerung der heidnischen Antike: kulturwissenschaftliche Beiträge zur Geschichte der europäischen Renaissance. 2 vols. Leipzig and Berlin, 1932:1:99, n. 2. Bertini, Aldo. "L'arte del Verrocchio." L'Arte 38 (November 1935): 462, n. 2. "Professor Volpi Publishes Verrocchio Work." Art News 33 (Saturday, June 1, 1935): 12, repro. Volpi, Elia. 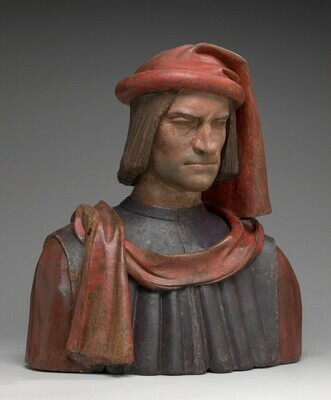 Lorenzo de' Medici: Busto in terracotta opera di Andrea del Verrocchio (1435-1488). Città di Castello, 1935: not paginated, repro. Cortissoz, Royal. An Introduction to the Mellon Collection. Boston, 1937: 23. Duveen Brothers, Inc. Duveen Sculpture in Public Collections of America: A Catalog Raisonné with illustrations of Italian Renaissance Sculptures by the Great Masters which have passed through the House of Duveen. New York, 1944: figs. 145-149. Frankfurter, Alfred M. "Another Great Kress Gift to the National Gallery." Art News 42 (November 1-14, 1944): not paginated. Frankfurter, Alfred M. The Kress Collection in the National Gallery. New York, 1944: 10, repro. Paintings and Sculpture from the Kress Collection. National Gallery of Art, Washington, 1945 (reprinted 1947, 1949): 186, repro. Seymour, Charles. Masterpieces of Sculpture from the National Gallery of Art. Washington and New York, 1949: 179, n. 36, repro. 117-119. Finley, David E. "Museum Director's Choice: From great art in public collections experts select their favorite works." Life (February 21, 1955): 94, repro. Paintings and Sculpture from the Samuel H. Kress Collection. National Gallery of Art, Washington, 1959: 404, repro. Walker, John, Guy Emerson, and Charles Seymour. Art Treasures for America: An Anthology of Paintings & Sculpture in the Samuel H. Kress Collection. London, 1961: 45, fig. 39. Covi, Dario. “Four new documents concerning Andrea del Verrocchio.” The Art Bulletin 48, n. 1 (March 1966): 101-103. Passavant, Günter. Verrocchio. Sculptures, Paintings and Drawings. Complete Edition. Translated from the German MS by Katherine Watson. London, 1969: no. 4. Seymour, Charles. The Sculpture of Verrocchio. Greenwich, CT, 1971: 127-128, no. 34, fig. 176. Covi, Dario. "Review of G. Passavant, Verrocchio, translated by Katherine Watson, 1969." Art Bulletin 54, no. 1 (March 1972): 131. Pope-Hennessy, John. "The Forging of Italian Renaissance Sculpture." Apollo 99 (April 1974): 258. Middeldorf, Ulrich. Sculptures from the Samuel H. Kress Collection: European Schools XIV-XIX Century. London, 1976: 79. Schuyler, Jane. Florentine Busts: Sculpted Portraiture in the Fifteenth Century. New York, 1976: 302, fig. 80. Langedijk, Karla. The Portraits of the Medici: 15th-18th Centuries. 3 vols. Florence, 1981-1987: 1(1981):27-30; 2(1983):1140, 1158-1162, no. 28, repro. Alsop, Joseph. The Rare Art Traditions: The History of Art Collecting and Its Linked Phenomena Wherever These Have Appeared. Bollingen series 35, no. 27. New York, 1982: fig. 77. Walker, John. National Gallery of Art, Washington. Rev. ed. New York, 1984: 631, no. 984, repro. Elam, Caroline. "Art and Diplomacy in Renaissance Florence: Delivered to the Society on Wednesday 25 May 1988, with Professor Nicolai Rubenstein, FBA, in the Chair." RSA Journal 136, n. 5387 (October 1988): 817, fig. 4. Bartlett, Kenneth R. The Civilization of the Italian Renaissance: A Sourcebook. Lexington, MA and Toronto, 1992: 257, repro. Darr, Alan Phipps. “Verrocchio’s Legacy: Observations Regarding His Influence on Pietro Torrigiani and Other Florentine Sculptors.” In Verrocchio and Late Quattrocento Italian Sculpture. Steven Bule, Alan Phipps Darr, and Fiorella Superbi Gioffredi. eds. (Acts of two conferences commemorating the fifth centenary of Verrocchio’s death. I. April 1988 at Brigham Young University, Provo, Utah; II. June 1989 at the Accademia delle Arti del Disegno and the Harvard University Center for Italian Renaissance Studies at Villa I Tatti, Florence). Florence, 1992: 125-139, esp. 137. Fiero, Gloria K. On the Threshold of Modernity: The Renaissance and the Reformation. The Humanistic Tradition 3. 1st ed. [7th ed. 2015] Dubuque, Iowa, 1992: 25, fig. 16.1. National Gallery of Art, Washington. National Gallery of Art, Washington, 1992: 291, repro. Rolfi, Gianfranco, Ludovica Sebregondi, and Paolo Viti, eds. La chiesa e la città a Firenze nel XV secolo. Milan, 1992: 32, repro. Stapleford, Richard. The Age of Lorenzo de' Medici: Patronage and the Arts in Renaissance Florence. A Walking Tour of Italian Painting and Sculpture in the National Gallery of Art. Washington, 1992: 5. Ferrazza, Roberta. Palazzo Davanzati e le collezioni di Elia Volpi. Florence, 1993: 133 fig. 135, 134, 143 n. 194. The American Heritage College Dictionary, 3rd ed., s.v. "Medici," repro. Boston, 1993. Toscani, Bernard, ed. Lorenzo de' Medici: New Perspectives. Proceedings of the International Conference Held at Brooklyn College and the Graduate Center of the City University of New York, April 30- May 2, 1992. New York, 1993: not paginated, repro. Vasari, Giorgio. Giorgio Vasari Lives of the Artists: A Selection Translated by George Bull. Translated by George Bull. London, 1993: 39, repro. Feldman, Edmund Burke. The Artist: A Social History. 2nd ed. Englewood Cliffs, 1995: 89, repro. Walker, Paul Robert. The Italian Renaissance. New York, 1995: 30-32, repro. Butters, Suzanne B. The Triumph of Vulcan: Sculptors' Tools, Porphyry, and the Prince in Ducal Florence. Villa I Tatti / The Harvard University Center for Italian Renaissance Studies 14. 2 vols. Florence, 1996: I:310, II:385. Grieder, Terence. Artist and Audience. New York, 1996: 388, fig. 12.1. Kobrin, David. Beyond the Textbook: Teaching History Using Documents and Primary Sources. Boston, 1996: 41, fig. 3-3. Warren, Jeremy. "A portrait bust of Lorenzo de' Medici in Oxford." The Sculpture Journal 2 (1998): 1-12. Mazzotta Prum, Deborah. Rats, Bulls, and Flying Machines: A History of the Renaissance and Reformation. Charlottesville, VA, 1999: 16, repro. Luchs, Alison. "Lorenzo from Life? : Renaissance Portrait Busts of Lorenzo de' Medici." The Sculpture Journal 4 (2000): 6-23, figs. 2, 6, 21, and 22. National Gallery of Art Special Issue. Connaissance des Arts. Paris, 2000: 59, 61, repro. Vogel, Carol. "Another Trip for 'David'." The New York Times (July 18, 2003). Covi, Dario. Andrea del Verrocchio, Life and Work. Florence, 2005: 133-134, fig. 119. DeAngelis, Adrienne. "On the Ashmolean bust of Lorenzo de' Medici." The Sculpture Journal 13 (2005): 5-17. Warren, Jeremy. "Forgery in Risorgimento Florence: Bastianini's 'Giovanni delle Bande Nere' in the Wallace Collection." The Burlington Magazine 147 (November 2005): 737, fig. 19. Budd, Denise M. "Leonardo, Medici Ephemera, and the Art of the Pazzi Conspiracy." In Watching Art: Writings in Honor of James Beck. Todi, 2006: 104. Dietsch, Deborah K. "Lorenzo's new clothes: Colors awakened from centuries of grit, grime." The Washington Times (Saturday, August 12, 2006): B1, B3, repro. "New Look for a Renaissance Icon." Sculpture Magazine 25, n. 10 (December 2006): 12. Vogel, Carol. "Lorenzo the Magnificent, Restored to Power." The New York Times (Friday, July 28, 2006). Utari, Ginevra. "Maestro Verrocchiesco, Busto di Lorenzo il Magnifico / Verrocchiesque Master, Bust of Lorenzo the Magnificent." In Tosti, Barbara, ed. Mugello culla del Rinascimento: Giotto, Beato Angelico, Donatello e i Medici. Exh. cat. Palazzo Medici-Riccardi, Florence, 2008: 236. Belman, Michael, Alison Luchs and Shelley Sturman. “A Renaissance of Color: The Conservation of Lorenzo the Magnificent.” Facture : conservation, science, art history 1 (2013): 32-57. Kohl, Jeanette. “Casting Renaissance Florence: the bust of Giovanni de’ Medici and indexical portraiture.” In Carvings, Casts & Collectors: The Art of Renaissance Sculpture. Peta Motture, Emma Jones and Dimitrios Zikos, eds. London, 2013: 58-71, esp. 62-63, 70, repro. 63. McHam, Sarah Blake. Pliny and the Artistic Culture of the Italian Renaissance:The Legacy of the Natural History. New Haven and London, 2013: 118-119, repro. Rudolph, Conrad, Amit Roy-Chowdhury, Ramya Srinivasan, and Jeanette Kohl. "FACES: Faces, Art, and Computerized Evaluation Systems -- A Feasibility Study of the Application of Face Recognition Technology to Works of Portrait Art." Artibus et historiae 39, no. 75 (2017): 265-291, esp. 272-273, repro. 273, 288-289.